The Nordic Pure MERV 10 pleated allergen reduction electrostatic air filter will vastly improve the air quality in your home or business. With each pass through your MERV 10 pleated air filter, the air in your living space improves. This electrostatic air filter attracts and captures airborne dust, pollen, mold spores, pet dander, smog, dust mite debris, and baking flour. The MERV 10 pleated air filter is made of synthetic material that will not support the growth of mold and bacteria. Along with the reduction of dust on surfaces, this MERV 10 pleated air filter will attract and capture the small, allergy-aggravating micro-particles that can cause your family discomfort. 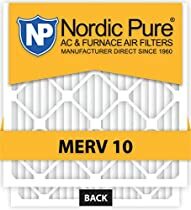 This Nordic Pure allergen reduction pleated air filter has a Minimum Efficiency Reporting Value(MERV) of 10 which means that it will collect more than 85-percent of 3.0-10.0 microns of contaminants and up to 65-percent of particles 1.0-3.0 microns. Particles in indoor air are measured in microns, which are 1/1000 of a millimeter. A human hair is about 70 microns wide. This high performance air filter will outperform non-electrostatic fiberglass, washable, or disposable poly filters. The effectiveness of your air filter will depend on your environment. We recommend that you change the air filter every 30-90 days depending on the conditions in your home. The MERV 10 electrostatic pleated air filter will help keep your environment healthy as well as keeping your air conditioner and heating systems running efficiently. Why would this say 24x24 when it is smaller than that? I have 6 unusable filters.....hose job for sure. Someone else mentioned that the size is not exactly as stated. Actually, in the detailed description of the filter, they give the exact size of the filter. Not sure why it wouldn't be 24x24x1, but, whatever. I found that it is actually a little small, and will have to buy 24x25x1 filters in the future. The product is advertised as being 24x24x1 when in fact it is smaller. It was more like 23 1/2 x 23 1/2x 3/4. It didn't sit well in the frame that holds it in place.